This book/CD pack allows you to explore the styles of Lightnin' Hopkins, Blind Blake, Mississippi John Hurt, Blind Boy Fuller, and Big Bill Broonzy. Through Sultan's arrangements, you will learn how studying the masters can help you develop your own style. 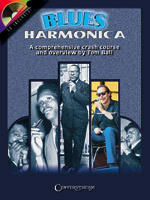 This book/CD pack features a comprehensive crash-course on all aspects of the blues harmonica. Written informally and in only tab notation, this book encourages players to learn at their own pace while developing their own style and feel. 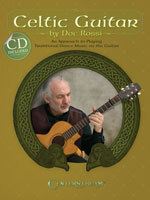 The accompanying CD includes demonstrations. 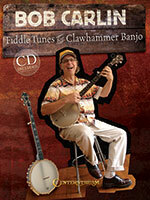 Renowned instructor and Grammy nominee Bob Carlin is one of the best-known banjoists performing today. This book, an update of his 1983 classic with the welcome addition of a CD, teaches readers how to play 32 best-loved pieces from his first two solo recordings: Fiddle Tunes for Clawhammer Banjo and Where Did You Get That Hat? Includes fantastic photos from throughout Bob�s career. Although the cittern has a history spanning 500 years and several countries, like its cousin the Irish bouzouki, it is a relative newcomer to contemporary traditional music. Doc Rossi, a well-known citternist in both traditional and early music, has created this book for intermediate to advanced players who want to improve their technique, develop ideas and learn new repertoire. 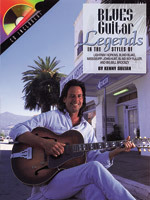 Guitarists can play all of the tunes in this book on the guitar by tuning C F C G C F, low to high, and putting a capo at the second fret. The lowest line in the tablature then corresponds to the fifth string. The CD features all the tunes played at a medium tempo. 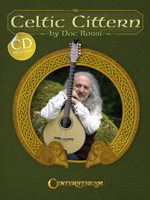 Doc Rossi, a well-known citternist and guitarist in traditional and early music, has created this book for intermediate to advanced players wishing to improve their technique and learn new repertoire. He�s chosen tunes from England, France, Flanders, North America and Corsica to reflect the broad range of the instrument. He teaches right- and left-hand techniques, ornamentation, arranging and other topics, as well as his own unique tuning to make playing traditional music easier. The CD features all of the tunes played at medium tempo.